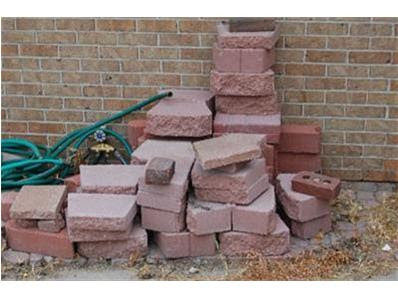 Mary the Nebraska Realtor found this... um... pile of bricks. Yay? "Includes: FREE home improvement set, for a handy man. Also includes hose and cold water, for those embarrassing mistakes." I love your blog! I found it some days ago, and have now read through the whole thing. Thank you for making me laugh so hard that the neighbours started wondering. Maybe the bricks are an ADU - an "Accessory Dwelling Unit"... for rattlesnakes, or big hairy spiders. I've been to Licoln, Nebraska--they don't have rattlesnakes. But, it is infested with Cornhuskers. Actually, I think that would be a selling point. When I see a big pile a bricks I see a million possibilities. You could make a nice little flower box, or lay them out as stepping stones. I mean you never know when a big pile of bricks will come in handy.